Three local church youth groups have taken out-of-state trips this summer: Grace United Methodist Church went to Cairo, Ill., for a mission trip; Paynesville Lutheran Church traveled to Atlanta for a national youth gathering; and St. Louis Catholic Church took a mission trip to the Pine Ridge Indian Reservation in the Black Hills. The Grace United Methodist Church youth group went to Cairo Ill., a poor, mostly African American community located near the intersection of the Ohio and Mississippi rivers. Their trip was in coordination with "Youth Works!" Twelve GUM youths - Bridgette Johnson, Ben Lingl, Megan Mackedanz, Scott Millner, Jeff Schaefer, Darren Schultz, Amanda Stelling, Laura Stoneburner, Tom Stoneburner, Stacy Thomsen, Jessie Virant, and Tanya Whitcomb - spent five days in Cairo. They were chaperoned by Jerry Burr, Linda Jensen, and Bill Virant. According to GUM youth director Linda Jensen, half of their time was spent painting and repairing houses for the people in Cairo, while the other half was spent doing "kids club" or "180," which was organized and directed toward teenage kids, according to Tanya Whitcomb. It gave them the opportunity to have fun with kids their own age. Laura Stoneburner explained that kids club was a time where the youth would set up activities for the local kids to participate. The youth could have fun while showing God's love to these less fortunate kids. "It's a really humbling experience. When you get back, you can't help being thankful for what you have," said Stoneburner. In Cairo, "There's nothing for kids to do but walk the streets," said Jensen. "I think our eyes were really opened." Only 23 percent of the people in the city of Cairo pay taxes, Jensen explained. The poverty there is simply accepted. 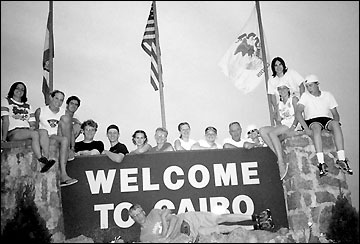 The group stayed in a school in Cairo, where temperatures were often over 100 degrees. The ceiling also leaked quite badly, according to Whitcomb. The school was given a one-year probation to raise their standards or it would be closed down, said Jensen. The GUM youth had been on mission trips before and plan to continue trips if there is interest from the youth, according to Jensen. Seven youth and two adults from St. Louis Catholic Church traveled to the Pine Ridge Indian Reservation in South Dakota through "Youth Works!" This is the same program that the GUM youth went with to Cairo. Hannah Voss, the youth director at St. Louis Catholic Church, chaperoned the trip along with Amy Buermann. The group spent two days painting houses and two days in "kids club," which was very similar to Vacation Bible School, as most people know it, according to Voss. They spent another day sightseeing at places like Mount Rushmore and the Crazy Horse monument in the nearby Black Hills. The group stayed in a school in Wanblee, where conditions weren't the greatest, according to Voss, but the youth handled it pretty well. 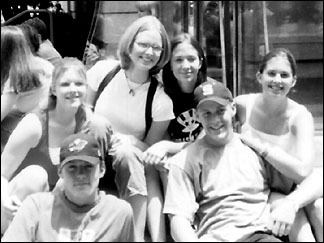 Voss, who has been the youth director at St. Louis since May 2002, has taken weekend trips with the youth, but nothing mission based. "This was a good experience to see God in a different light," she said. Previous trips the youth had taken weren't about service, according to Voss. They had more of a "feel good" basis. The people on the Pine Ridge Indian Reservation had mixed feelings toward the youth being there, said Voss. "The people we painted for were grateful, and the little kids enjoyed it," she said. But she felt others there really didn't want any help from them. Voss hopes she can bring youth on similar trips in the future. Twenty-three youth and five adults from Paynesville Lutheran Church traveled to Atlanta this summer for a national youth gathering. The youth gathering had more than 25,000 people in attendance during the week PLC youth were there. The following week, another 23,000 attended, according to Dianne Nelson, youth director at PLC. Mass gatherings were held in the Georgia Dome each morning and evening of the gathering's five days. Mornings were spent in mass Bible study. Evenings featured mass gatherings with music by artists such as Ken Medema and Lost and Found, as well as speakers. Adam Ingalsbe, who will be a senior at PAHS this fall, enjoyed David Vasquez, a pastor from Luther College in Decorah, Iowa. Another speaker was Craig Kielburger, a 22-year-old man who became an advocate for children's rights at the age of 12. According to Nelson, his message was that age doesn't matter; anybody can make a difference if they choose. One afternoon was spent on a mission event. Each afternoon 3,000-5,000 youth and adults would go out into Atlanta and help in soup kitchens, clean up parks, help at daycare facilities, and various other things. The group from PLC helped clean a park for an afternoon. The group spent other afternoons doing various activities. They toured the Coca Cola factory, saw an Atlanta Braves game, and spent some time at the Interaction Center, which housed numerous activities for the kids from skateboarding to basketball to fingernail painting, said Nelson. Each national youth gathering has a theme. The theme this year was Ubuntu, a South African word meaning, community and humanity. Nelson was quite pleased with the theme. She mentioned how in America, a guest will be given the guest room to stay in. In South Africa, they will be given the master bedroom. "We as Americans have lost part of the sense of community and fellowship," she said. This is a theme that people attending the gathering could actually take home with them and practice. 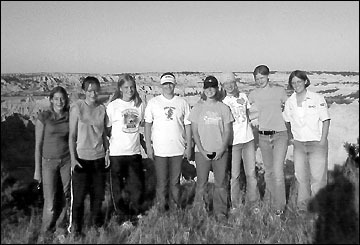 The PLC youth generally operate their summer trips on a three-year rotation. Last year was a mission trip, this year was the national youth gathering, and next year will be some type of high adventure (i.e. mountain climbing or whitewater rafting). "There is some value to doing a national youth gathering," said Nelson. "Very few times will we have the opportunity to stand among 25,000 Lutherans praising." "Having communion with 25,000 people is pretty amazing," she added. The next gathering for the PLC will be held in San Antonio in the summer of 2006.